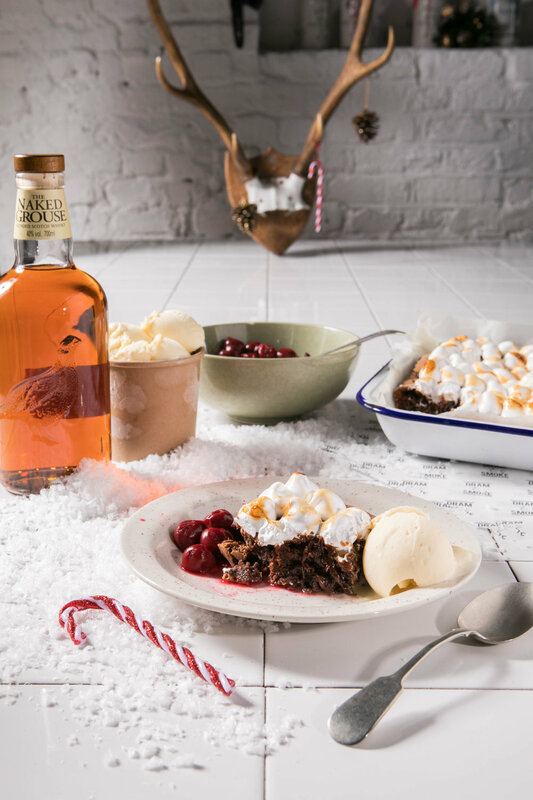 Everyone loves a brownie and this family-style version takes things in a celebratory direction with a grand blowtorched marshmallow top and boozy ice cream accompaniment. Pre-heat the oven to 170C, gas mark 4. Combine the red wine vinegar, sugar, water and spices in a pot and bring to the boil. Set aside to cool for 30 mins before adding the cherries and leaving to steep. To make the custard for the ice cream, bring the milk and cream to a simmer in a saucepan over a medium heat with the split vanilla pods. In a mixing bowl, whisk together the egg yolks, glucose and sugar until the sugar granules have dissolved and the mix is light & fluffy. Once the milk mix has reached a simmer, slowly pour it into the mixing bowl with the creamed egg yolks, whilst constantly whisking. Pour the combined mix back into the pot & slowly bring up to 84C, stirring continuously, ensuring that the eggs don't scramble or catch on the bottom! When the temperature reaches 84C, turn off the heat, add the whisky & leave to cool for 30 mins. Put in an ice cream machine & leave to churn for an hour, or until the ice cream has set but is still velvety & smooth. If you don't have the time (or an ice cream machine!) a tub of good vanilla ice cream will also work great! Whilst the ice cream is churning, start the brownie mix by melting the chocolate and butter in a heatproof bowl of a small pot of simmering water. Stir it regularly so that the mix combines. In a separate bowl, whisk together the eggs, sugar and half of the salt until pale and it has doubled in volume. Pour the melted chocolate slowly into the egg mix & stir to make sure it is combined. Add the flour and chestnuts in 3 batches, beating the mix well after each is added to avoid any pockets of flour. Pour the mix into a parchment-lined baking tin, sprinkle the rest of the smoked salt over the top and bake for 30 mins. Once baked, leave the brownie on the side to cool slightly. It can be served beautifully at this staged but if you’re looking for something a bit extra special then top it with homemade toasted marshmallow. Using a sugar thermometer check the temperature of the sugar mix - you're looking to bring it up to 120C. Combine the hot sugar syrup and the gelatine into a bowl and whisk on a high speed until the mix has turned white, fluffy and is forming into stiff peaks (around12-15 mins). An electric mixer helps! Scoop the marshmallow mix into a piping bag using a spatula and give the bag a shake to ensure there's no air pockets. Leave the mix to rest in the piping bag for 10 mins to allow the mix to set just enough for the marshmallows to keep their peaks when piped. Pipe onto the top of the brownie and blowtorch to give them a luxurious toasted flavour. If you don't have a blowtorch, a quick flash under a hot grill will give the same effect.